The headline distributional numbers for the Senate tax plan from the Joint Committee on Taxation (JCT) attracted much attention because they showed that households making under $75,000 would actually see a tax increase on average in 2027. Many have noted that the House bill is not as bad on this score, with the JCT analysis showing that “only” households earning between $20,000 and $30,000 will face a tax increase on average in 2027. But behind the ostensibly better House distribution score is a major catch—low- and moderate-income households will face tax increases unless corporate tax cuts trickle down to them in the form of higher wages, which historically has not happened when corporations receive large tax cuts. The individual income taxes low- and moderate- income households pay through withholding on their paychecks and on tax forms each year will certainly increase by 2027. The central mechanism of both versions of the Tax Cut and Jobs Act (TCJA) is easier to see in the Senate bill: permanent tax cuts for corporations, coupled with eventual individual income tax increases for low- and moderate-income households. By 2021, households making less than $30,000 will see individual income tax increases under the Senate tax bill. And the only individual income tax changes that are permanent are the repeal of the individual mandate from the Affordable Care Act (ACA) and indexing tax brackets to a slower growing measure of inflation, thereby pushing people into higher tax brackets more quickly. This means that on average every income category is paying more individual income taxes in 2027 under the Senate tax bill. These tax increases are used to pay for permanent tax cuts for big corporations. Since corporate tax cuts skew towards the rich, for low- and moderate-income households, this is an awful trade. Defenders of the TCJA, of course, assure us that the corporate rate cuts will mostly show up in higher wages. This is obviously untrue, but it is worth noting that most scores of the TCJA do allow some portion of corporate rate cuts to trickle down to wage growth. The JCT, for example, assigns 25 percent of the benefits of corporate rate cuts to labor. But even with this assumption of modest wage growth resulting from corporate rate cuts, households making under $75,000 still face a net tax increase on average in 2027. Their individual income taxes increase by $273, while assumed trickle-down benefits from corporate tax cuts only offset $47 of this, leaving a net tax increase of $226 on average. This same dynamic is at work in the House bill, but just slightly obscured by the fact that the combination of assumed wage growth stemming from corporate rate cuts just manages to exceed the individual income tax increases on most families and make their net take-away from the TCJA trivially positive. But if corporate rate cuts don’t eventually find their way into wage-growth for low and moderate-income households, then households making between $10,000 and $50,000 will see outright losses on average from the TCJA. By 2027, households between $10,000 and $50,000 are actually facing a $39 tax increase on average on their individual income taxes, but the assumption of corporate rate cuts boosting wage growth increases their incomes by $47 on average. Again, without this trickle-down assumption, they’re facing outright losses even from the House version of the TCJA. Low- and moderate-income households should be more than a little wary of eventually trading individual tax increases for corporate tax cuts on the assurance that these corporate cuts will boost their own paychecks. For corporate tax cuts to help wages, one must believe in a series of economic bank shots: Higher after-tax corporate profits should boost private savings to allow firms to invest more in productivity-enhancing investments in the face of higher post-tax profit rates. Firms will see sufficient demand for new output to be incentivized to make these investments. These investments lead seamlessly to increased productivity which then boosts worker’s wages up and down the distribution of wages. Real world data, however, argues that these bank shots are likely to go awry. After-tax corporate profits are already near historic highs while interest rates are incredibly low, and yet investment has been weak in this business cycle. It’s not clear how continuing to push after-tax corporate profits still higher will change the trend. And even if investment were spurred, increased productivity is no longer sufficient to ensure benefits flow down to typical workers. 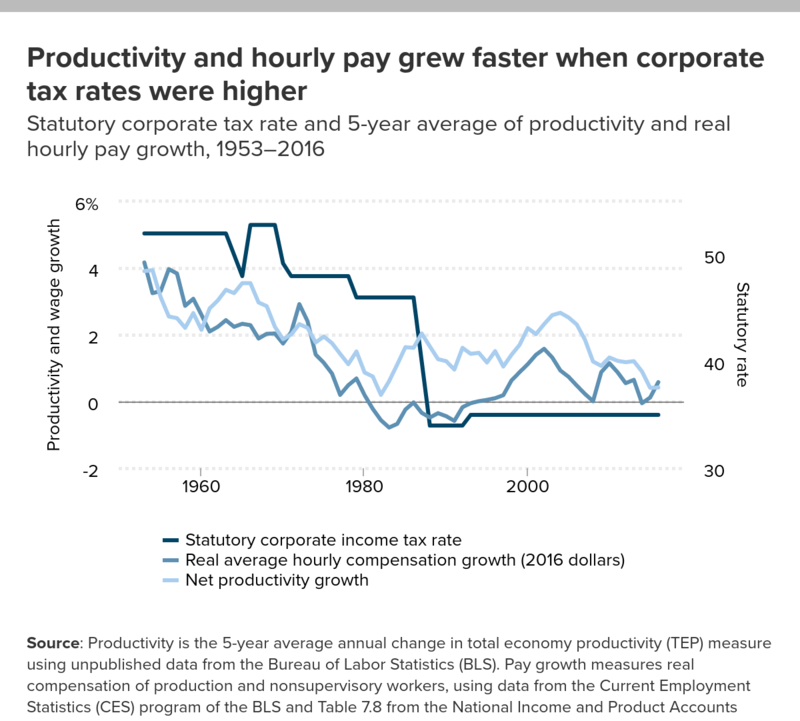 There is no evidence from the recent U.S. economic history, no evidence from international comparisons, and no evidence from individual U.S. states that corporate tax cuts will boost the wages of American workers. And CEOs have already signaled their intention to shovel corporate tax cuts to shareholders, not workers. Faced with eventually paying more in individual income taxes in both the House and Senate tax bills, workers should not trust that corporate tax cuts will make them whole again.